When I was shopping for a house, I was much more concerned with the property and the garage/shed situation than I ever cared about the house. One of the houses I put an offer in on (that fell through later) you literally had to turn sideways to get into the bathroom. But it had a detached two car garage and a 20 x 30 pole barn, with its own well. My real estate agent can attest that at each house we looked at, I'd spend maybe 10 mins walking through the houses, and 30-40 in the outbuildings. I can throw a bed in anything. It's "The Shop" that I'll be living in. Heck, I lived for 15 months in a shipping container... so I'm pretty flexible. After mowing my grass with a push mower once, I was positive I would rather have a riding mower. It's not that I really needed one. It probably takes about an hour to push mow my front and back yard. But I grew up on a farm. I'm used to having tractors and backhoes and such at my disposal. and I do have three acres. Most of that is woods, but eventually I will cut a path around the property. My father and I had picked up a riding lawnmower from a guy a few months earlier. That guy was getting rid of it because he had hit a size able tree stump with it and bent the mower deck all out of whack and tore bolts out and pretty much destroyed it. Funny thing about "destroyed," in the house I grew up in "destroyed" and "junk" were transitional words. "the deck on that mower is destroyed, right now." It's very rare that my father will say "can't" when it comes to fixing things. There are definitely times where he decides things are not worth the effort of fixing them. We got a backhoe from the cemetery up the road from my parents house via this attitude. They had seized the motor up and couldn't seem to fix it. Dad traded them a little dodge pickup truck for this "junk" backhoe. Keep in mind, they had seized it up a couple weeks before this deal. Dad drove the little truck down there. Messed with the backhoe for maybe 5 minutes, started it up and drove it back. The take away from that story isn't that he's got some sort of magic powers for talking to machines, (although I would definitely not rule it out) its the attitude. And it's definitely something I aspire to emulate. So we robbed some parts from some other mower decks dad had, drilled some new bolt holes and did some welding. Before too long we had a working riding lawnmower. That's not to say it works like new. You get to engage and disengage the PTO once on it, then you have to shut it off and put that belt back on it. Having never seen the thing before it was wrecked, getting everything that was bent, beat back into it's original configuration was a pipe dream. But its better than spending money I don't have. After I get my tractor to my house I notice a definite problem. The tractor has a 42 inch wide deck. 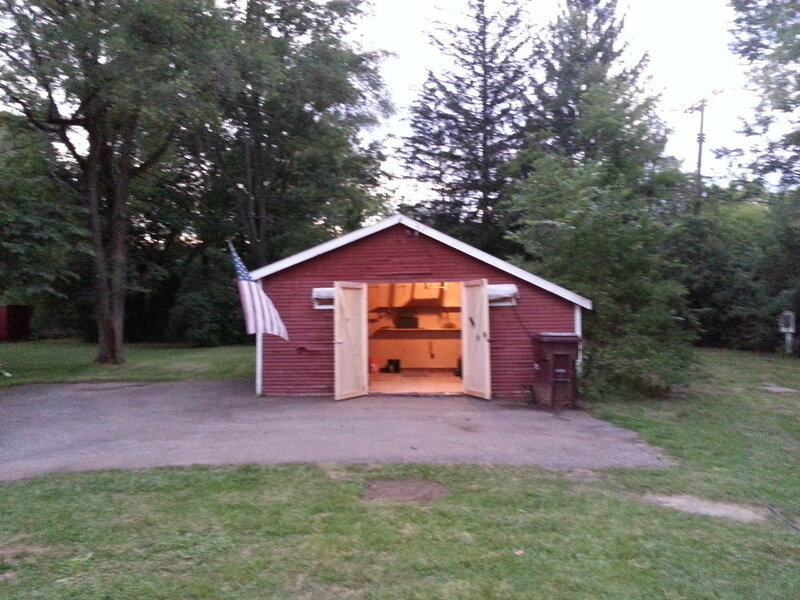 the door to my shed to store it is 36". This wont do. So I look at my gable wall and it has two small windows I don't want to mess with. but between them I have 6 foot of space. 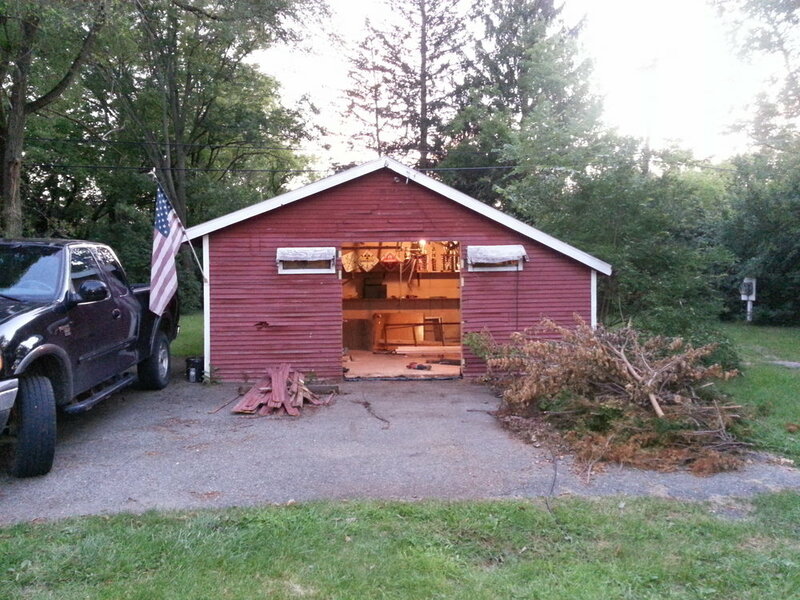 No ridge beam, so I have no real load from the roof on that wall so I decided I can cut in a 6' set of double doors. Clearly, I wasn't going to put in a store bought door. So I put up a header, and some trim studs. Then I made some doors. the doors are pretty basic. just a couple of rails and styles joined with a half-lap joint in the corners. The rails and styles were just 2x4's on the flat. I did a few test cuts in some scrap with my circular saw till I got the blade depth right, made a bunch of relief cuts, then cleaned it all up with a chisel. I did one door at a time, so that I could be sure they fit. I have found the more you measure, the more chances for error to can get. 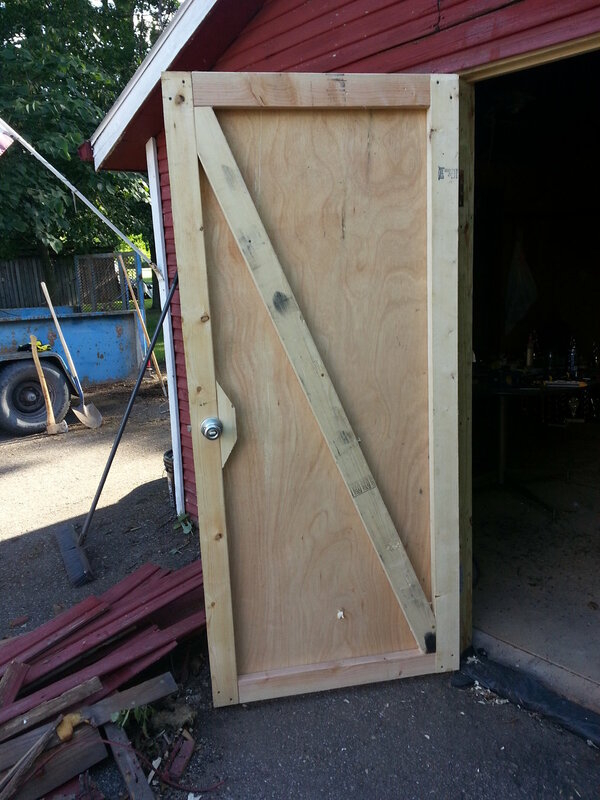 Better to build one, then mount it, then measure the remaining space for the second door, than to do the math. I know it seems like the same difference, but the former seems to bring better results. After the frame I added in a diagonal piece just to resist the sag that is inevitable over time. Because I am skinning them with plywood, this is probably not needed. But I did it anyway. I figured the diagonal cuts by just laying the diagonal under the frame and tracing the interior of the frame through. I just used some galvanized gate hinges, mortised in like normally would for a door. Used a slide bolt latch into the top and bottom plate for the dummy door, and a keyed doorknob for the active door. Pro-tip: Sawzalls are your friend. House, year one. At length.